Since 1979, SIFAT has shared God’s love in practical ways with the poor in our world. Without our donors and supporters, this could not have been possible! To celebrate these 35 years, we are building a commemorative patio and fire pit alongside the beautiful Mad Indian Creek on our international campus in Lineville, Ala.
Purchase a commemorative brick as part of SIFAT’s 35th Anniversary. Celebrate a special event in someone’s life, honor a friend or family member or memorialize someone special! New Campus Bridge Under Construction! Many of you may remember the news of our suspension bridge (on SIFAT’s campus in Lineville, AL) collapsing this past July during our Learn & Serve Summer Experience. We continue to thank God for his protection of our participants and his provision for our organization after the event. We now have reason to celebrate — a new bridge is under way! A new suspension bridge is being built on our Galilee Campus. The bridge will span Mad Indian Creek connecting our campus once again. This bridge is not only functional, it will also serve as an example of a monumental bridge project SIFAT implemented in Quesimpuco, Bolivia in 2008. 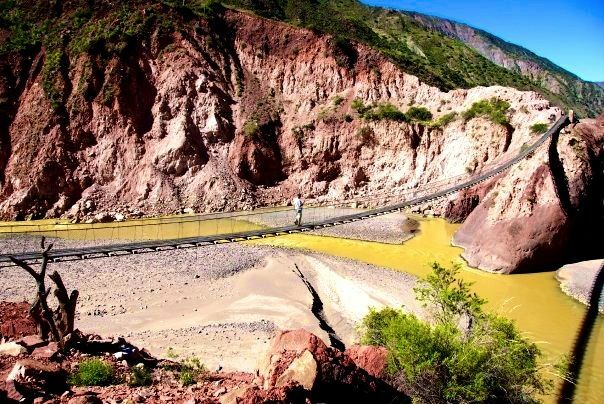 This bridge, in Quesimpuco, Bolivia, is the inspiration for the new suspension bridge on SIFAT’s Lineville, Alabama campus. Wow! The spring season of campus events started strong. Last week, two groups took part in separate retreats. Lovers Lane UMC from Dallas, Texas, brought youth from their deaf ministry to SIFAT for a Learn & Serve style retreat. The students even braved the cold weather during the Global Village Overnight Experience. Our staff enjoyed learning some sign language, and thanks to our volunteer Sarah Lewis, even provided an interpretor to give their translators time to enjoy the activities. The seventh grade from Springwood School from Lanett, Ala., participated in a cross cultural retreat with an emphasis on cultures in the Global Village. They had the opportunity to eat meals from South America, Africa and Asia. Esperance, our intern and Practicum graduate, shared with the students about being a Rwandan growing up in Kenya. This week, we have three groups taking part in retreats during their spring breaks. ReMIX Ministries from FBC Jonesboro (Ark.) are college students from Arkansas State University. They came in Saturday evening and will be leaving after lunch on Wednesday. Their retreat is similar to our summer Learn & Serve, only a little shorter. Tonight, they’ll be in our Global Village. The Epsicopal Diocese youth from north Alabama arrive this afternoon and will have the opportunity to leave the campus Wednesday to participate in a local ministry project. While here, they will also participate in cross cultural training, appropriate technology hands-on application (they’re cooking lunch on our stoves) and the overnight village experience. Alexander City Methodist Church is bringing a youth work team at the end of the week. Their youth group is coming to Learn & Serve this summer, but they’ll have a mini-retreat and campus work projects to serve our campus and help us prepare for L&S 2008. Are you interested in bringing a group to SIFAT? We have several different retreats from which you can choose. Our staff will work with you to develop a unique experience that best meets your group’s needs. For retreat information for youth groups, please contact Jamie, waldhourj@sifat.org. For other age groups or facilities rentals, contact Haley, lewish@sifat.org. While preparing for the Fall Practicum, we realized that our Education Building needed some updating and maintenance. Our staff and a work team from Alexander City Methodist Church in nearby Alexander City, Ala., have “flipped” the interior in record time. Since our longtime appropriate technology volunteer, Dale Fritz, recently moved, we turned his former workshop into the new library. Because we moved the library, our students now have two large classrooms to use this fall. The entire building was repainted from ceiling to baseboards, and new carpet was installed. We have also received donated computers for students to use during their training. We’re still in the process of unpacking everything and getting it in order, but we now have a wonderful meeting space for groups using our facilities, as well as a large learning environment for our students this year. Thank you to everyone who has given their time and support to this project!